If you’re an accounting professional or even an accounting student, it’s never too soon to start plotting your course to becoming a CFO. Reaching the C-suite represents the top of the mountain for both accounting and finance professionals. But the path to CFO is a long and challenging road for accountants. Accountants handle the finances of the past, while corporate finance professionals spend their time worrying about the finances of the future. A CFO needs to be an expert at both. How can accounting pros distinguish themselves from the competition and become a CFO? Here are four tips. 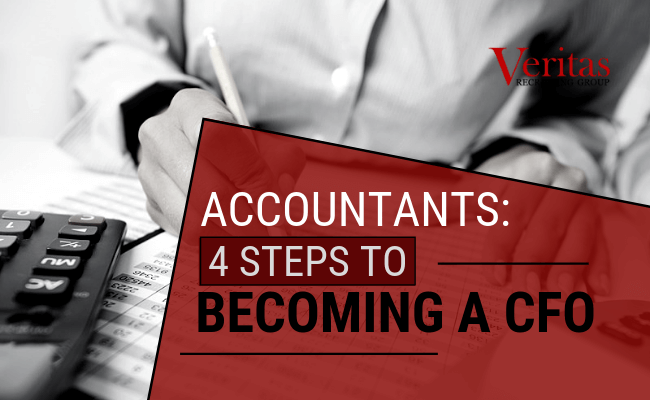 While cultivating non-accounting skills is essential for career-minded accountants, the path to the C-suite starts with being a stellar accountant. Mastery of accounting is a fluid process as rules, regulations, and technology are constantly evolving and altering the job. A great accountant needs to be someone who is always learning and improving their accounting skills. Accounting professionals will be hard-pressed to become a CFO without first becoming a controller. Having strong management skills is essential for CFO’s, and your work as a controller is the best opportunity to show organizations your management prowess. When we discussed earlier that it’s important for you to make it well known that you want to become a CFO, that starts with letting decision makers know you want to become a controller. Until you demonstrate success in a controller role, it’ll be difficult to gain consideration for another promotion. For many accounting professionals, reaching the controller role can feel like a final destination. It serves as the highest rung of the pure accounting ladder, so making the leap from a controller to CFO is a challenging one. Which leads us to the next tip. Throughout your career, it’s always a good idea to make your goal of reaching the CFO role known. Throughout your organization, there will be a wealth of advice and guidance for you to absorb that can help you achieve your goal. Senior members of your accounting and finance departments are great sources of information, but only if you seek out their advice and guidance with your career. The more business relationships you can build both within and outside your organization the better. It’s not who you know, it’s who knows you and more importantly who perceives value in you. Perceived value will increase your chance of being considered for promotions and for opportunities outside of your company. Budgeting, planning, and analysis are key technical skills that are inherent on the finance side of a corporation, but that doesn’t always get included in the accounting department. To become a CFO, accountants must demonstrate that they have the ability to be forward thinking and not just show what happened in the past. The most common area where an accountant can show their finance chops is with Variance Analysis. Identifying variances, whether to budget or previous time periods, is the first step. Then being able to explain why the variances happened is the next step in order to help management make decisions about how to move forward with the business. Look for and volunteer for projects where you can help your current company with budgeting, FP&A, M&A, decision support and any other analysis work. The more exposure and experience you can get to this type of work the better. You also might consider going back to school and getting an MBA. If you’re feeling stuck in a controller role, even if you have your CPA, enrolling in a finance-centered MBA program can be an excellent way to improve your career growth opportunities. Need assistance in accelerating your corporate accounting career? Contact us today to learn how Veritas Recruiting Group can help. Looking to grow your finance and accounting career? Contact Veritas Recruiting Group to start plotting your course to becoming a CFO.